Now pressing past his 80th birthday, Buck Rogers is still going strong as an important part of pop culture and science fiction history. He's gone from the height of popularity to the laughingstock of an industry and back again, endured parody after parody and outlasted each of his imitators. Now, with a renewed interest from the retro audience, one of comics' oldest original creations is back to launch a brand new ongoing series from Dynamite Entertainment. Under artist Carlos Rafael's watch, the character has undergone a sharp makeover. His new wardrobe is an interesting mix of modern sci-fi tendencies and kitschy nods to the character's past. Buck's gown has been simplified and streamlined, but the helmet and needlessly tall leather boots he dons are undeniable throwbacks to his earlier days. The set of curvy, brightly glowing blue racing stripes that work their way across his body may modernize his appearance, but they also give the impression that he's more than just an adventurous guy floating through outer space. Did Buck Rogers ever have any super powers? In these threads, he looks primed and ready to be the next bearer of the Nova Force. Rogers still carries a bright yellow ray gun that was hard to swallow in the ‘50s, but it's balanced out a bit by the cold metal sheen of its companion – a generic modern pistol. It sounds like a marriage made in the depths of hell, but in action, strangely, it all works together surprisingly well. Rafael feels right at home in a book that centers itself on space exploration and alien habitats. His best work is early in the issue, when the story is more concerned with introducing this particular set of alien invaders rather than exterminating them. He brings a nice sense of scale to the page when the pace is leisurely and the intent is to dazzle readers with unfamiliar landscapes and wide-angle shots of the Earth, but as the things pick up he loses his focus. In the action scenes specifically, I often had trouble figuring out which stock action pose Rogers was striking. 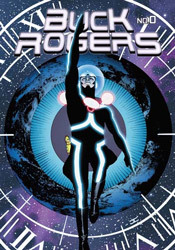 I don't have a problem with pure action just for the fun of it, which is just about all you'll get in Buck Rogers #0. Without an appealing lead character, though, it loses some of its edge. This isn't bad – Scott Beatty shows us he's got enough imagination to make this thing work and Carlos Rafael's artwork matches that creativity – it's just shallow and didn't particularly move me to investigate the regular series. For the cover price of a quarter, I guess you can't ask for too much. Flip through it, pick it up if you've got some spare change, but you probably won't read it more than once.